The British National Antarctic Expedition took place between 1901 and 1904. Located around the South Pole, Antarctica is a huge land covered in ice. It is also the coldest and windiest place on earth and in winter, the sun never rises so it is dark day and night for months. Before the days of radio and aircraft, the expedition was to be very difficult and dangerous. The expedition's ship was called the RRS Discovery. Built in Dundee, she was specially designed for travelling in the Antarctarctic, having a strong, iron bow to help it ram through the ice and a thick, wooden hull to stop if from getting frozen. Discovery left Cardiff on 6th August 1901 with the aim of transporting a group of men to Anatarctica to carry out scientific research and geographical exploration in what was then a largely untouched continent. The expedition was the vision of Sir Clements Markham, President of the Royal Geographical Society and he chose Robert Falcon Scott, a British Naval officer, as its leader. 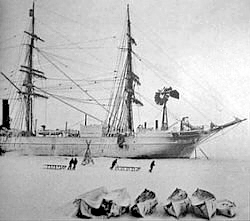 Soon after arriving however, Discovery became frozen into the sea ice and Scott decided that the expedition should continue to live and work aboard the ship. All food on board was: tinned, dried, bottled or pickled - the men often moaned that it was tasteless and boring. For relaxation: educational lectures were held, a newspaper called the South Polar Times was edited by the Third Officer, Ernest Shakleton and the men even liked playing football on the ice. The scientists risked frostbite and snow blindness to take measurements and collect specimens as they hauled sledges through blizzards in temperatures as low as -45oC. With a lot of courage, they managed to discover over 500 new kinds of animal species and map hundreds of miles of unknown coastline, even naming one area after King Edward VII. Scott, Shakleton and a colleague named Wilson traveled further south than any man before them, only turning back to the Discovery on 30th December 1902 when Shakleton became ill with scurvy - for this, they trudged over 950 miles in 93 days. Controlled explosions from two relief ships were used to blow Discovery free from her icy prison on 16th February 1904 and she finally returned to Portsmouth on 10th September 1904. Scott was acclaimed as a national hero and awarded numerous honours, including being made a naval captain.